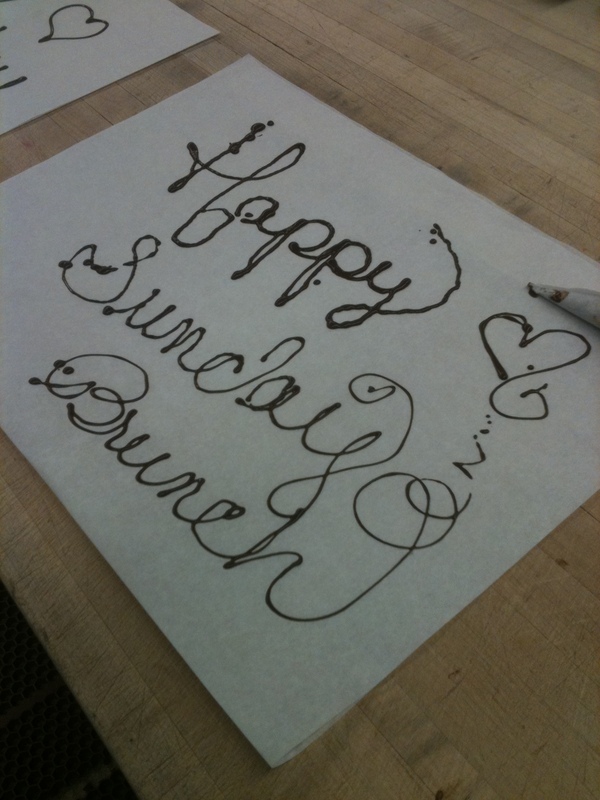 Sunday Brunch at the Bristol Lounge? Yes, please. On Sunday morning, I hopped out of bed at 7:30 AM (a rare occurence for me on a weekend) to get ready for a day in Boston. The occasion? Brunch at the Bristol Lounge at the Four Seasons Hotel. A few weeks ago, I entered a contest on the Boston Brunchers website to attend a complimentary brunch hosted by the Four Seasons. To enter, all we had to do was follow the hotel on Twitter (@FSBoston) and leave a comment saying why we thought we should get to go to the event. Representatives from the hotel picked 7 winners. I almost fell out of my chair at work when I saw the tweet saying I was one of the lucky 7. When I arrived at the hotel at 10 AM, the hotel PR rep, Kristan, greeted us with a smile, gave a brief description of what our event entailed and graciously led us to the hotel’s pastry shop. Once inside, we were given a warm welcome by two of the hotel’s pastry chefs. 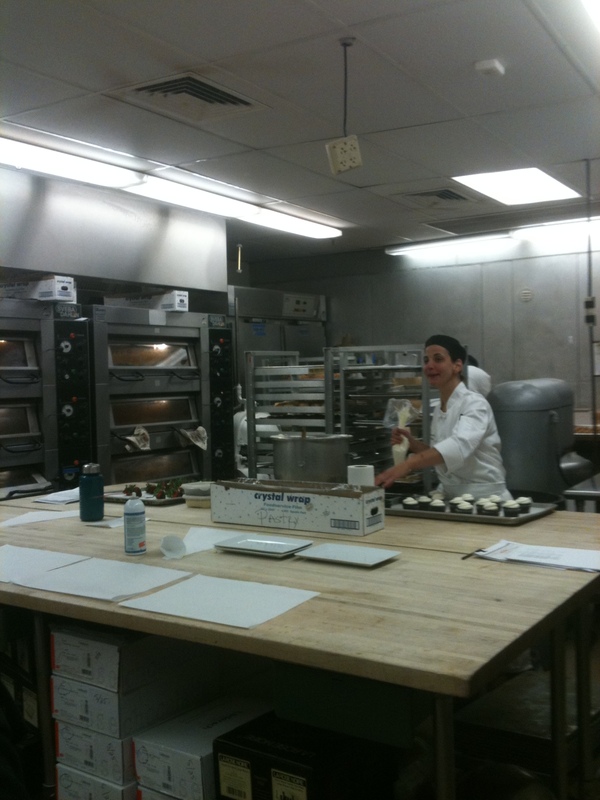 We noticed seven stations of parchment paper with a makeshift piping bag on the large counter. Chef Ashley proceeded to give us a lesson on how to pipe words in chocolate by gently putting pressure on the bag and letting the chocolate flow as it pleased. I need some practice (check mine out… looks like a 5 year old did it!) but his was incredible. 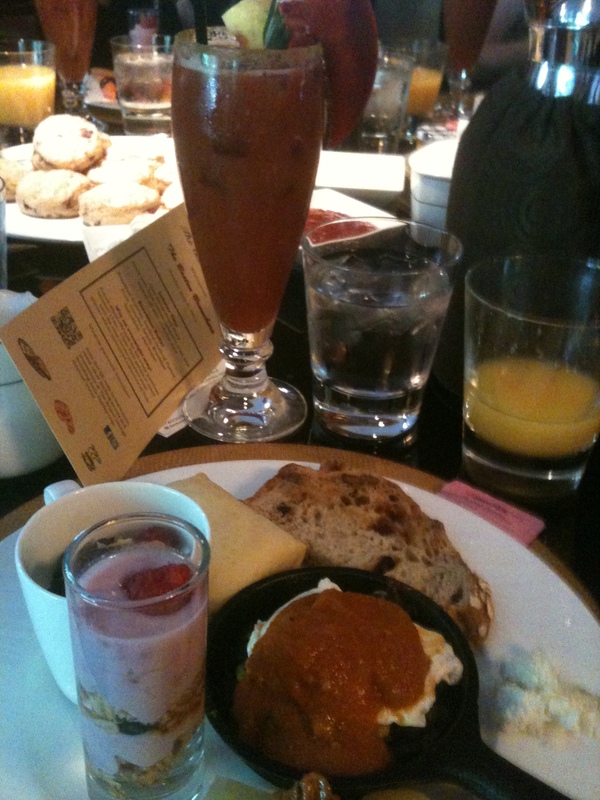 Some of my fellow brunchers were good at it as well. Mom, if I just start melting chocolate and using obsene amounts of parchment paper, please do not be alarmed. From there, Kristan took us down to the Bristol Lounge where a large buffet was set up for brunch. We sat at a round table, each table setting decorated in our honor. Then, the head chef of the hotel, Chef Vosika, came to chat with us, giving us fun facts and relaying the importance of brunch to himself personally as well as the hotel. Time to eat? Yes please. There were so many options, I had a hard time choosing. I think I walked around and around at least 10 times with an empty plate debating on what to get. However, that did not stop me from filling my plate for a first go-around. 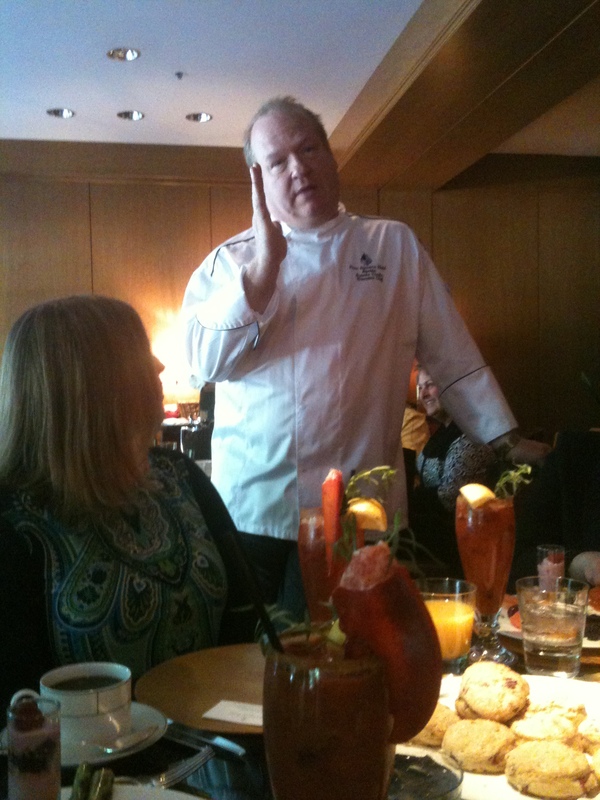 When I returned to the table, hot coffee, fresh orange juice and a “Lobster Trap,” the Four Seasons Boston’s rendition of a Bloody Mary sat in front of me. I dug into my (first) plate of food which included individual huevos rancheros, a cheese blintz, a mini yogurt parfait, oatmeal with berries and poached pears with cranberries and walnuts (by far my favorite item of the whole brunch and the only thing I had a second helping of!) There was baked french toast (good thing I tried that last, I could’ve eaten an entire batch of it), bocconcini, and cranberry toast with a smear of goat cheese. I also helped myself to a warm scone with homemade strawberry jam that our pastry chef buddies sent down after we left them. I must say, the atmosphere, the food, the generosity and graciousness of the entire staff at the Four Seasons and the Bristol Lounge made me feel right at home. Although the decor was on the fancy side (hello.. it’s the Four Seasons! ), I was completely comfortable and chatted endlessly with my fellow brunchers: Megan, Justin, Kimmy, Jessica, Robin and Athena. Thank you so much to Renee (we missed you!) and the Four Seasons for hosting us (and giving us a behind-the-scenes tour)! It truly was an incredible experience and I hope to go back again soon. Oh – and about those fun facts that Chef Vosika gave to us… Well, the Four Seasons was giving away a free overnight stay at their Boston location and I was one of the four finalists via Twitter. No, I didn’t win… but for being one of the finalists, the Four Seasons gave me a complimentary dessert to enjoy in their Bristol Lounge. Now I have a definite excuse to go back… who wants to come with? 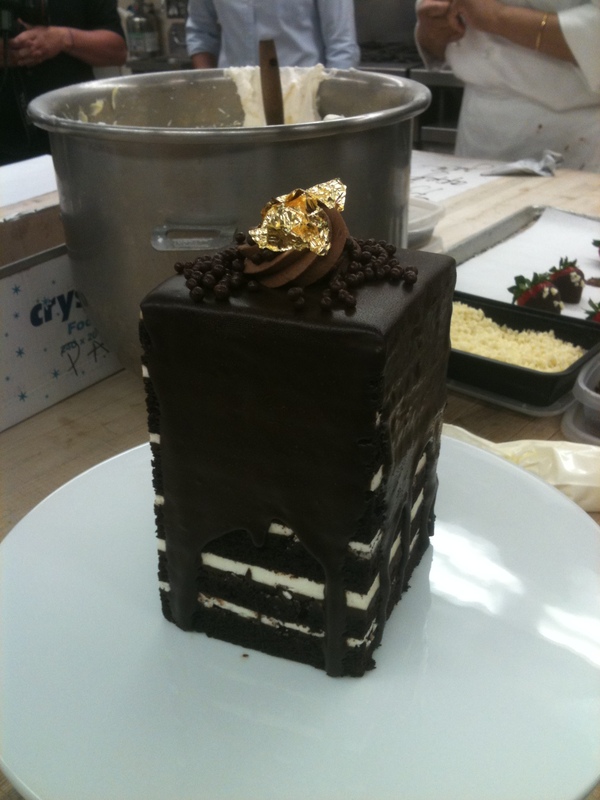 I can’t eat this cake tower, building, Prudential Center-looking skyscraper all by myself! 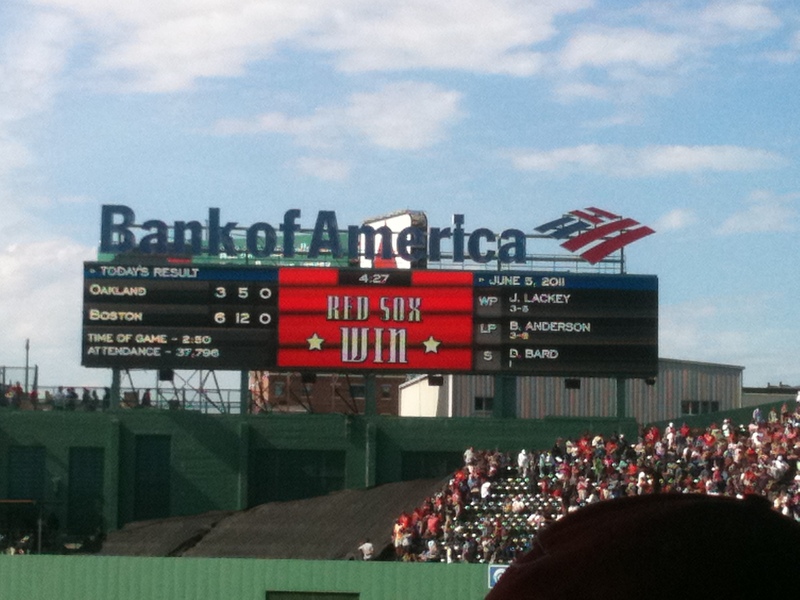 And I might have taken in a Sox game with my bestie Alyse after brunch. 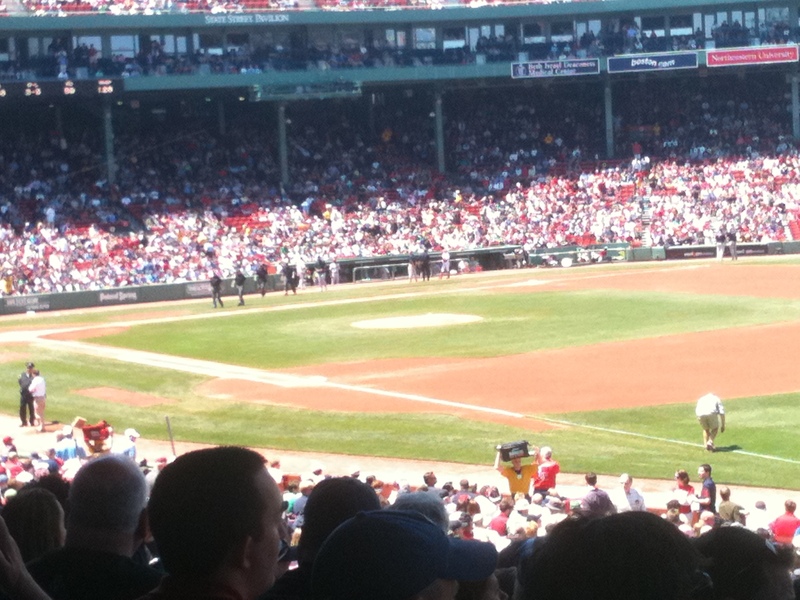 The beer was cold, the guys in front of us were funny and the Sox won. Not bad. When I go back with my Mom for Afternoon Tea, I’m going to demand the recipe for those poached pears. Incredible.